The view of this stunning championship course from the road at Stagsden is deceptive, as it gives the impression that the golfer could be in for some heavy exercise. 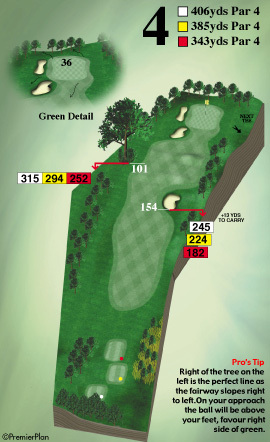 The drive to the Clubhouse only serves to heighten this suspicion, but from the elevated position of the 1st tee the course can be seen to be laid out along the contours and across the rolling valley, thus avoiding any significant climbs. 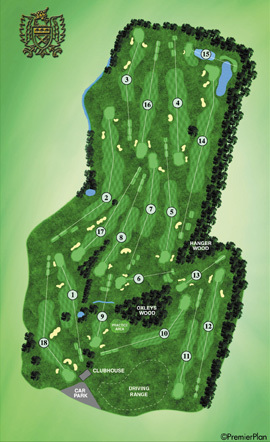 The layout of the holes uses the natural topography and the course blends well into the surroundings rather than imposing upon it. Constant feedback from both members and visitors alike, tells us that this course improves every year and by common consent, it is now in its best ever playing condition and presenting itself beautifully. You'll enjoy playing this course, but the challenges facing you will vary dependant upon your own standard of golf, so treat it with respect on your first few visits to ensure that you negotiate its many potential pitfalls. Hole 1. A deceptive opening Par 4; avoid the big oak trees and the bunker off the tee - but remember to check where the flag is on this long, two-tiered green! Hole 2. A chance for the big guns to cut the corner on this dog-leg Par 5.but be warned, everything kicks left towards the pond & out of bounds, so don't bite off more than you can control! Hole 3. 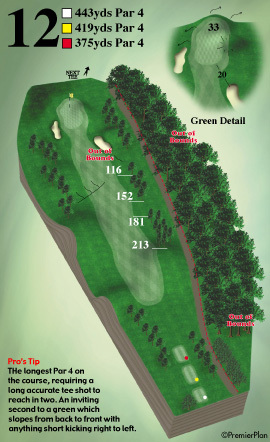 Play for position off the tee for the best chance of a par on this short Par 4 - check where the pin is as you walk from the 2nd green to make sure you don't get blocked by the right hand bunker. Hole 4. 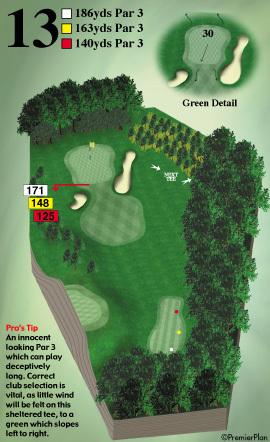 The first of two demanding Par 4's. 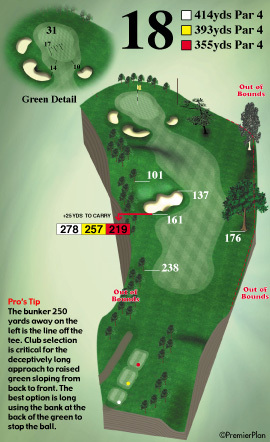 Try to hug the right half for the best angle into the green - but make sure you take enough club if you're coming in over the bunkers not a green you want to be putting from the back though! Hole 5. This hole plays longer than its yardage as it's nearly all gently uphill. 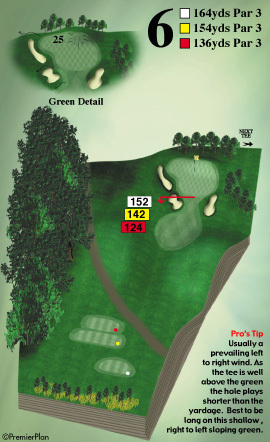 Most people won't reach the brow of the hill off the tee, so watch out for the bunkers left and right on this difficult Par 4. Hole 6. 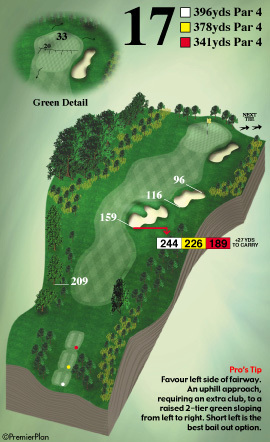 The first Par 3 - it's not long but it's no time to lose concentration as this green is well protected by bunkers.3 is never a bad score here. Hole 7. Big hitters need to watch out for the gorse on the left if trying to cut the corner on this dog-leg Par 4. The ball keeps rolling on this long green - so watch where you land it! 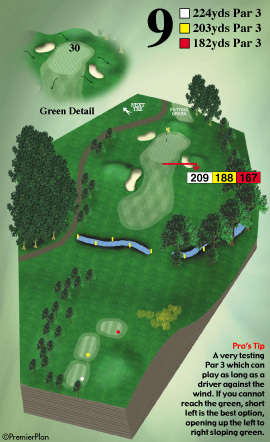 Hole 8. Everything kicks towards the trouble on the right on this Par 4 - but the further right on the fairway you are, the better angle you'll have into this elevated green! Hole 9. 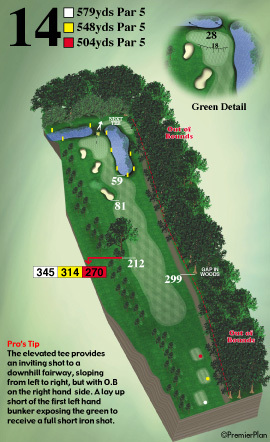 Long Par 3. Play safe and you'll walk off with a better score! Hole 10. 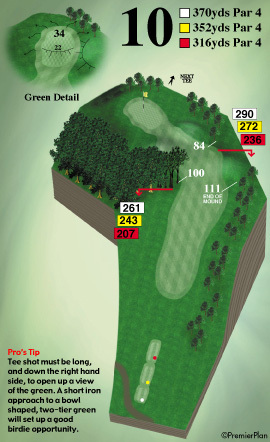 Uphill dog-leg left where position is key; this short Par 4 demands respect as too tight up the left leaves no shot to the two-tiered green. Hole 11. No bunkers here - plenty of room off the tee but favour the right side for the best angle into this Par 4. 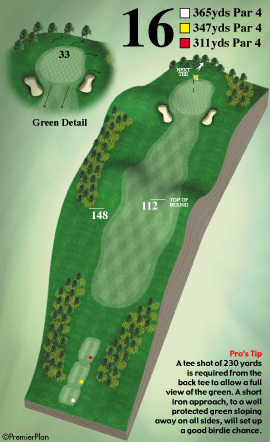 Hole 12. A good drive is needed to get up in two on this long Par 4. 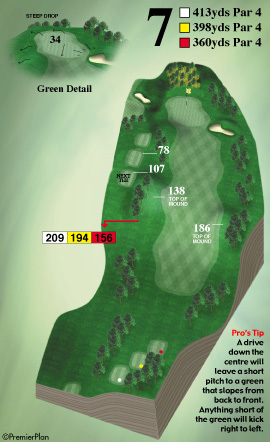 Aim up the right for the best angle into this tough hole. Hole 13. The third Par 3 which calls for a well struck shot to avoid the bunkers on this well guarded green. Hole 14. 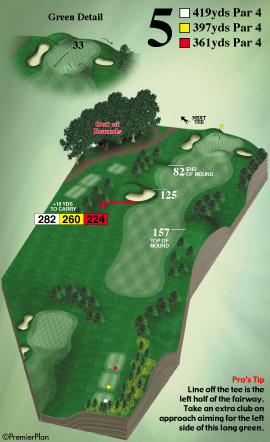 Take in the view - then be careful on this downhill Par 5! 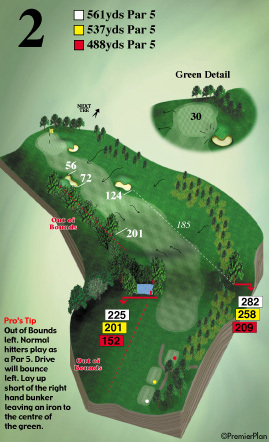 Everything kicks towards the out of bounds off the tee.and don't be greedy with your second or you might get wet! A true "risk & reward" hole! 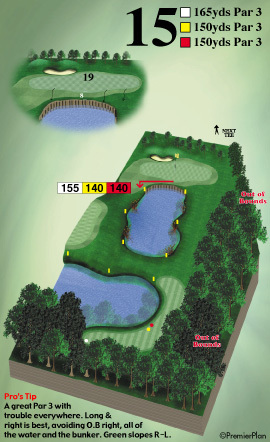 Hole 15. This hole begs the question "do I or don't I" as you look at the pin just over the water on this short Par 3. 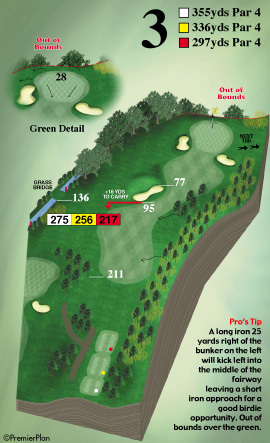 With out of bounds right and a bunker long too, there's plenty of room left of the green to escape with your par - but many a card's been ruined here! Hole 16. A good drive sets you up on top of the hill for the best view - be careful with clubbing here, the second shot plays shorter than it looks on this Par 4! Hole 17. Another picturesque tee shot.but don't be lulled into the bunkers on the right! 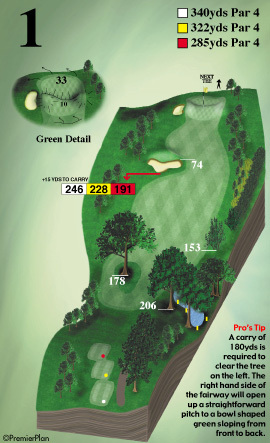 It's uphill into this Par 4 - so make sure you take enough club to get up on this two tiered green. Hole 18. 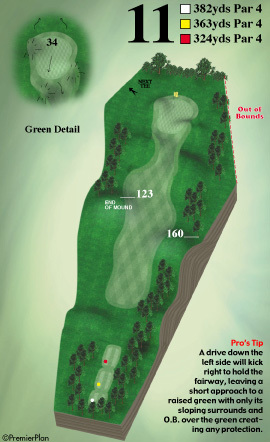 Uphill dog-leg Par 4; with plenty to keep you interested right to the end! 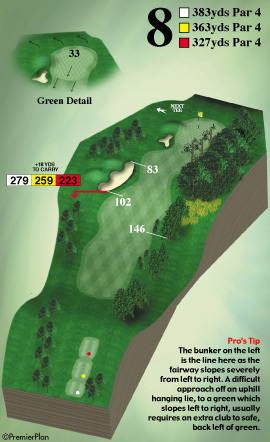 Hug the left hand bunker off the tee - and take enough club to get up to the pin on this excellent closing hole.